It is a simple and typical country house built at the top of a hill facing the village of Vinci: on the ground floor the big kitchen with the fire-place, the room to keep wheat and “salami”, the dining-room for very special occasions; on the first floor all the bed-rooms (for grand-parents, parents and four children). There was also the cellar with the big barrels of wine and the olive-oil. The name of the property is the original name from the area surrounding that was called “Marcello”, the land around the house was and still is all cultivated with olive trees as well as a vineyard on the east side at the bottom of the hill; in front of the house there’s a “barn” to keep working tools, it housed the rabbits, the pigs and on the west side there was the hen-run. Beautiful house with the best views! Vinci & Vitolini look like a postcard. Laura is fantastic! Gave us good information about the house and area. Plenty of room for 8 people. Would definitely go back. thank you! Looking forward to seeing you again! We had a wonderful holiday in the Casa di Marcello. The house is magnificently situated and has a very authentic feel about it. The rooms are very spacious, and it is well kept. The house is on the edge of a hill (far from neighbours and the street), so the children could play freely. The views from the house on Vinci and surroundings are stunning!! We made wonderful walks starting from the house. It is also in the centre of the important Tuscan cities, and close to Empoli, where we took the train to Firenze. We will definitely be back! A special thanks to Laura, our host. She is absolutely kind, warm and welcoming. She was always prepared to help or give advice in flawless English! I really don't know where to begin. We stayed at La Casa Di Marcello from 10/4-10/11. First of all, Laura was the perfect host/owner. She met us in Vinci upon our arrival - we were a little late but she didn't mind. The property is located on a "bluff" that overlooks Vinci and Empoli and MUCH MORE of the Tuscan countryside. The property has endless views of rolling hills with grape vineyards and olive trees - picture perfect. You wake up every morning to the sound of church bells off in the distance - not loud but very comforting. From Laura's place we were able to take easy day trips to Empoli/Vinci, Siena, San Miniato, Cinque Terra and Florence. We didn't make it to San Gimignano but based on a lot of positive feedback I highly recommend making a trip there. Now for what's inside the house. There were 8 of us on vacation and La Casa Di Marcello had more than enough room to accommodate - 4 Bdrms/2 Baths upstairs and Full Kitchen, front room and "greeting" room/hallway downstairs. All the bedrooms were very spacious. Also, each bedroom had a wonderful view of either Vinci, Empoli and/or the Tuscan countryside. And lastly about Laura the owner - she is GREAT! Upon arrival and getting us settled into the house, Laura took the time to tell us about the house, her family and the surrounding area. She is genuine and wants your vacation to be something special. I actually called her 2x during our week there (not related to the house but asking about directions and how to handle an accident - a tourist actually hit my car while in San Miniato). Anyway, she answered the phone both times and graciously helped me out. Our group also did the Italian cooking lesson on our last night - I HIGHLY recommend it. Laura, Maria Grazia and Mikala guided us through a late afternoon/evening cooking lesson and the best Italian food we had during our stay. It was fun, everybody participated and there was great conversation during the whole time we were together. The best testimonial for La Casa Di Marcello is that everyone in our group said "we will be back". This place is truly special and would recommend it to anyone that wants to experience a vacation Under the Tuscan Sun. We had a wonderful stay at the Casa di Marcello. The view from the house is absolutely magnificent and the surroundings were beyond expectation. The house is located privately on a mountain top and all around the house are olive trees as far as the eye can see. It is so beautiful, very recreational, and at night the stars stand out clearly. The nearby village - Vinci - is very nice and (as all Italians) the people there are very friendly and welcoming. You can find good places to buy Italian specialities and good places to dine. The house is very cosy, well-equipped and all rooms have amazing views over the mountains. The house has comfortable beds and is well furnished which made our stay very pleasant. In short: We had everything we needed during our stay. The host Laura is a very sympathetic and trustworthy person who made sure we had the best vacation possible. We would love to come back to Casa di Marcello on another occasion. I booked this house as the pictures which Laura had put up for us to see really sold it to me. It was comfortable and spacious for the 10 of us, with plenty of cooking equipment and room at the table to sit and eat and play games late into the night. The setting was amazing with views across the countryside and over to the hills, with a lovely patio to sit out on as well as a hidden pergola type area on the edge of the olive grove.The rooms were light and airy and the beds comfortable.It was a great place to visit many historic sites and having a railway station a few kilometeres away made visiting Florence a dream.I am hoping that I can get another family get together organised so we can stay in Laura's lovely house again before too long. This was one of the most memorable holidays I have experienced for years. I keep looking at the photos on my mobile and they give me a wonderful warm feeling. 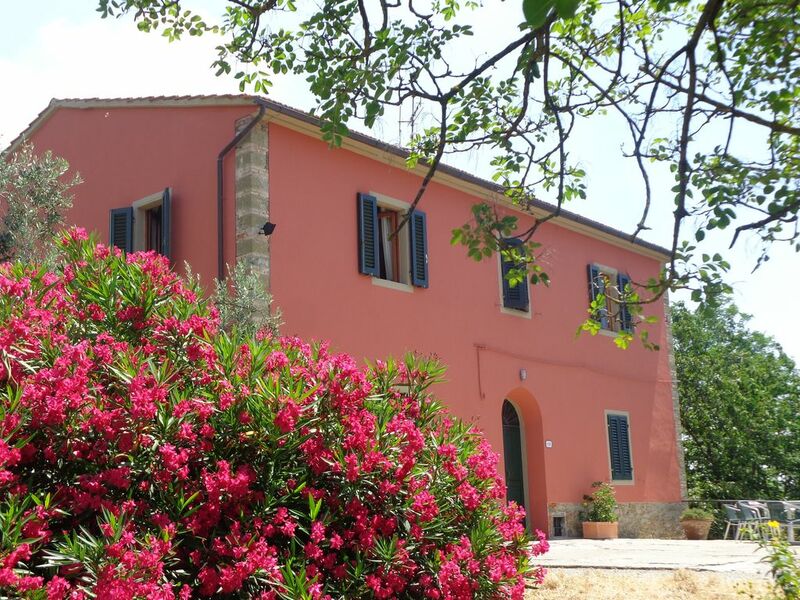 “La Casa di Marcello” is on the top of a hill between Vinci and the village of Vitolini, in a beautiful panoramic position, from the house you can enjoy a wonderful view on the typical Tuscan countryside. It's a very quiet area, ideal for relax and peaceful holidays. The distance from the house to Vinci is km 2,5 if you walk through the country or km 4 if you follow the road, everybody certainly knows Leonardo da Vinci: the artist, scientist, mathematician, writer.. Leonardo was born in Vinci in 1452, he was an illegitimate son to Piero da Vinci. Vinci, through the centuries, has remained a village, it has definitely enlarged since Leonardo’s time but hasn’t modified its shape and activities, it’s mainly an agricultural village with a good wine and olive-oil production, it's worth visiting Leonardo’s birthplace and museum.